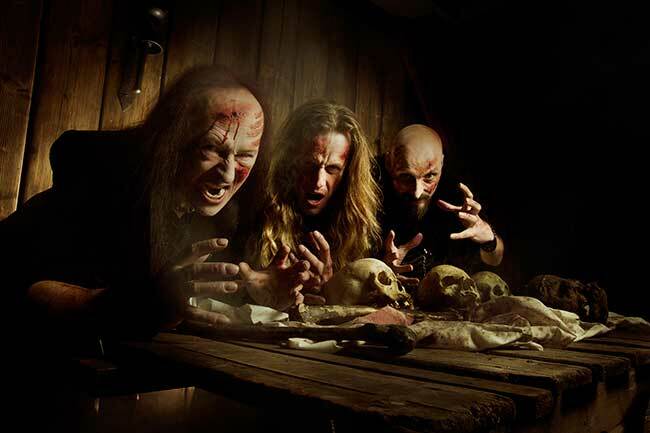 Their first studio albums since 2015’s From The Very Depths (there was a live album released in 2017 entitled Live At The Hammersmith Odeon), Venom’s latest, Storm The Gates on Spinefarm Records, once again features Conrad ‘Cronos’ Lant on vocals and bass (of course), once again joined by ‘La Rage’ on guitar and “Dante" Needham pounding away on the drums. Produced by Cronos himself, this, thankfully, doesn’t see the band reinventing their sound but instead sees them doing what they’ve done well for the better part of forty years now – and that’s play fast, dark metal joining elements of punk and thrash into the mix with an overly Satanic image way up front. The album, which is a bit more polished than some might expect or hope for, opens with Bring Out Your Dead, a reasonably ‘classic’ sounding Venom track with a nice, dark, thrashy vibe to it. That said, when Cronos rolls his R’s when he sings ‘bring’ it sounds a little silly. And that’s okay – but it’s an odd touch on an otherwise appreciably dark song. Credit for trying to be theatrical at least. Notorious is up next, and it’s a decent enough track but it does nothing to stand out. Sounds like Venom, sure, but it sounds like Venom going through the motions. I Dark Lord is an interesting departure from that sound but it works in elements of Nu Metal that sound out of place here, and not in an interesting ‘oh look, they’re trying something new’ sort of way either – it doesn’t work. 100 Miles To Hell gets things back on track, it’s one of the better songs on the album and if it sounds a bit like a throwback to the early days, so be it. Clearly the band has progressed in terms of their musicianship from those first few albums where speed and intensity were given priority over playing ability. This track gives us a nice mix of both their patented rawer sound and a more polished, musically potent Venom. Cronos’ vocals are completely on point here as well. 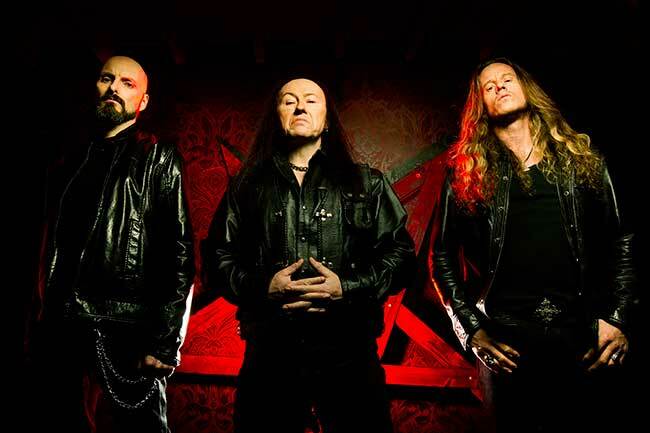 Dark Night (Of The Soul) continues that trend, it’s got a nice gallop to it, Cronos’ instantly identifiable sinister laugh opening the track before the track really kicks in. At times this almost sounds like it could be a Metallica track rather than a Venom track, but it’s gleefully over the top and you can’t help but appreciate the audaciousness of it all – occasionally you just kind of have to embrace the silliness of this one and go with it. Beaten To A Pulp is also really solid, featuring some really solid riffs from Rage and impressively fast drumming from Dante. It isn’t uncommon for Venom to work some punk influences into their music and you hear that here, it almost sounds like a cross between black metal and NYHC. Destroyer opens with a nice sort of doomy, dirgy sound, the instruments tuned low and Cronos’ perpetually tortured vocals wailing away. It’s the slowest track on the record by a big margin, but it works. The Mighty Have Fallen gets things back into more traditional Venom territory, blasting right from the start at a million miles an hour and proving that this line up, now together for over a decade, really can crank out some top notch blackened thrash. Rage throws in a pretty slick – and impressively strange – guitar solo here just before the two-minute mark that is worth mentioning. Over My Dead Body follows suit, as the trio quickly get into a thick groove off of which they bass some genuinely bombastic drumming and seriously impressive riffing. Cronos sounds like Cronos, he doesn’t try anything new with his vocals here but it suits the tone of the song just fine. Suffering Dictates opens with some wonderfully sludgy bass work that provides a pretty solid backbone for the track. There’s some odd effects work in here that gives this track an interesting sounds at times, but otherwise it’s standard Venom – dark, fast, ugly. We The Loud again sees the band pull from punk territory, with a fairly anthemic track mixing genres nicely and paying tribute to their roots. Immortal once again does a nice job of showing off Rage’s guitar chops, there’s some really impressive playing here on his part while the track itself allows Cronos’ growl to shine through nicely. 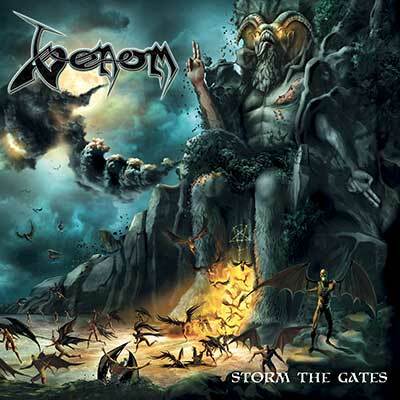 The album finishes up with the title track, Storm The Gate, ending things on a high note and again channeling the Venom of old but giving that sound a little spit and polish. It’s a catchy song with some solid riffs and a fine way to finish off the record. Venom might not be really be breaking any new ground here but maybe when you’re Venom you don’t need to. The first half of the album is a bit uneven but the second half is more than solid – not the most original record you’re going to hear this year, but a solid effort that should please the band’s legions of fans.